Hi folks, its great that this session is full, infact there is now a waiting list! If you think you might not be able to attend please let me know and click the button at the top to free up a space for someone on the waiting list! Thanks so much! Me too please re wait list. Hey guys I’ll get the next few sessions up soon, but basically these rides run on the first Saturday of each month. I would like to join the waitlist please if anyone can’t not make it this Sat 03rd March. Will the ride still be taking place if it keeps snowing? I will be leading it this Saturday. I'm keeping an eye on the weather. If it looks very cold and or icy then we may well have to cancel. Hopefully not but not looking too good at the moment. We head out to the lanes around Barnet which are usually colder and icier than central London of course. If it's like it is now outside my window we won't be riding. Ok thanks! If cancelled, would it be postponed for a following week or would we have to wait for the intro ride of april? It would be a shame to make people wait, if we end up cancelling we will try to put in another session soon - maybe next Saturday if people are around. That would be great! Alright, I'll be on the lookout. Thank you very much. Hi everyone, I'm afraid due to the weather we will be moving this session to next Saturday (10th March). Im sure youd agree that this is the best course of action. I hope you can still make it, but if you cant we will try to squeeze you in other sessions asap. I assume this means none of us need to rebook a place? We just turn up as before, but on Saturday 10th instead. Exactly. 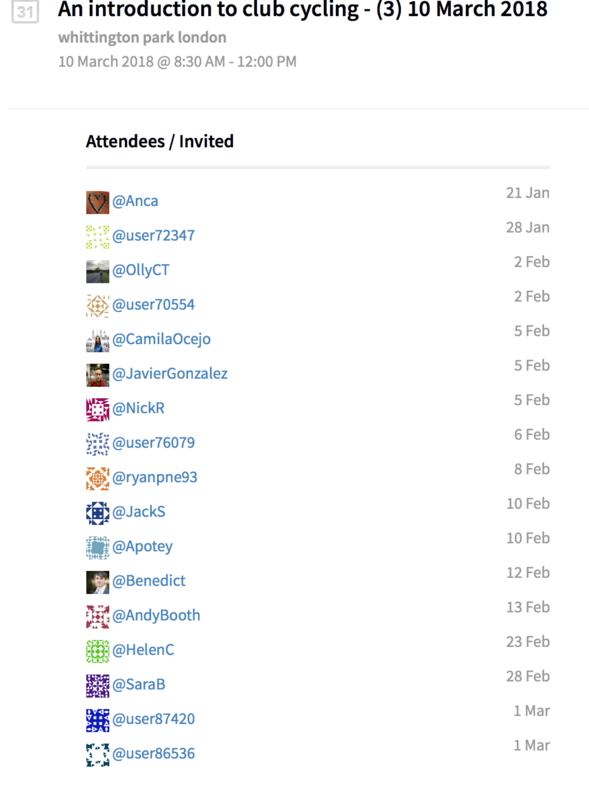 If you click on the attendee list above you'll see these people (below) are pre-booked for the 10th. If you cannot make it for any reason please remove yourself from the event so we can free up a space for another rider. For those of you who can, please change your generic userid to something we can recognise. Thank you. See you all a week on Saturday. I can't make next Saturday so I've dropped out. Hope to join you on the next one. Sorry you can't make it but thank you for letting us know. Thank you for letting us know. Sorry you can’t join us. Hi , Just wondering where in Whittington Park are we meeting?